Xamarin.Forms supports database-driven applications using the SQLite database engine, which makes it possible to load and save objects in shared code. This article describes how Xamarin.Forms applications can read and write data to a local SQLite database using SQLite.Net. Xamarin.Forms applications can use the SQLite.NET PCL NuGet package to incorporate database operations into shared code by referencing the SQLite classes that ship in the NuGet. Database operations can be defined in the .NET Standard library project of the Xamarin.Forms solution. 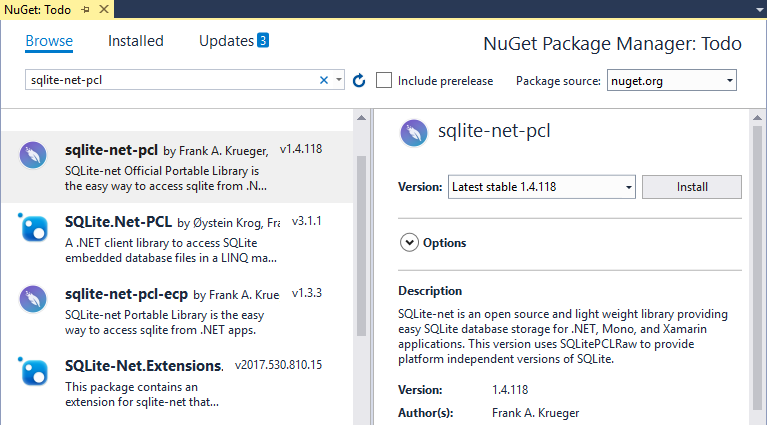 Despite the package name, use the sqlite-net-pcl NuGet package even in .NET Standard projects. The advantage of exposing the database as a singleton is that a single database connection is created that's kept open while the application runs, therefore avoiding the expense of opening and closing the database file each time a database operation is performed. The remainder of the TodoItemDatabase class contains SQLite queries that run cross-platform. Example query code is shown below (more details on the syntax can be found in Using SQLite.NET with Xamarin.iOS. The advantage of using the asynchronous SQLite.Net API is that database operations are moved to background threads. In addition, there's no need to write additional concurrency handling code because the API takes care of it. Xamarin.Forms supports database-driven applications using the SQLite database engine, which makes it possible to load and save objects in shared code. 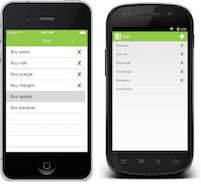 This article focused on accessing a SQLite database using Xamarin.Forms. For more information on working with SQLite.Net itself, refer to the SQLite.NET on Android or SQLite.NET on iOS documentation.